Marianne Wells Yoga School – a Yoga Alliance Registered School – offers one of the most comprehensive yoga teacher certification programs today, emphasizing safe and effective methods that prepare you to be a more inspiring and confident yoga instructor or a more faithful and assured practitioner. 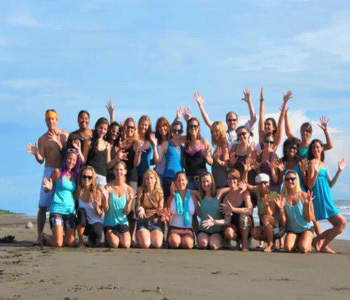 This immersion yoga teacher training was developed by Marianne to address gaps in many yoga instructor training courses. She is devoted to deepening your practice, knowledge and respect of yoga. 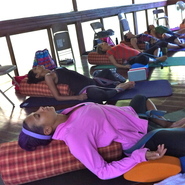 In this curriculum, participants study a variety of traditional yoga styles to knowledgeably explore and progress in their own personal practice, and to develop their own style of teaching moving forward. Now Let’s find the upcoming Training Sessions. But what about costs and other details? SESSION ENROLLMENT IS OPEN. REGISTER TODAY! We offer payment in full or payment plan with $195 registration deposit. Subsequent payments made via online invoices. THIS SESSION ONLY – Payment in full by July 7, 2012. Online payments processed through Authorize.net Merchant Services – a secure payment gateway. Payments are refundable with written notice more than 30 days prior to session start date, minus the non-refundable $195 registration deposit. With written notice within 30 days of session start date, you are welcome to attend a later session within 12 months following original session. Arrival day is Saturday July 14th. Arrive the day prior into San Jose for optimal group ground travel schedule July 14th. Schedule arrival flights into SJO airport on July 14th by 2pm the latest. Group ground transportation arranged at an additional fee for those arriving/departing during recommended timeframe. 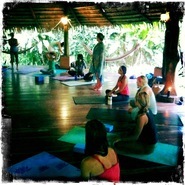 Training is held at The Goddess Garden – located in Cahuita, Limon Province, Costa Rica on the Caribbean coast. 6Training begins at sunrise on Sunday July 15th. 7Training ends on Saturday July 28th. Departure day is Sunday July 29th. Schedule departure flight from SJO airport at 1pm the earliest to allow for transit time and early check-in requirements. The airport you will fly into is San Jose Airport- Juan Santamaria Airport – SJO, in Costa Rica. Arrival date is Sunday February 24, 2013 and departure date is Sunday March 17, 2013 as listed on the Calendar and Registration page. Once you register and indicate your desire to travel with our group, I can help arrange group ground transportation at an additional cost. Price includes 21 nights lodging at The Goddess Garden, 3 daily meals, training, taxes. The airport you will fly into is San Jose International Airport – SJO.3We offer payment in full or payment plan with $195 registration deposit. Subsequent payments made via online invoices. 50% balance due on or before December 26, 2012. Payment in full by February 3, 2013. Online payments processed through Authorize.net Merchant Services – a secure payment gateway. Payments are refundable with written notice more than 30 days prior to session start date, minus the non-refundable $195 registration deposit. With written notice within 30 days of session start date, you are welcome to attend a later session within 12 months following original session. Arrival day is Sunday February 24, 2013. Arrive the day prior into San Jose for optimal group ground travel schedule Feb 24th. If flying into SJO airport on February 24th, schedule your arrival time earlier than 1pm the latest to allow for transit time to the coast. Group ground transportation arranged at an additional fee for those arriving/departing during recommended time frame. Training begins at sunrise on Monday February 25th. Training ends on Saturday March 16th.10Group departs on Sunday March 17th. Schedule departure flight from SJO airport on Sunday March 17th no earlier than around 1pm to allow for transit time and early check-in requirements. 11The airport you will fly into is San Jose Airport- Juan Santamaria Airport – SJO, in Costa Rica.